5-Axis Milling | Wagner Machine Co. While we can and do run production jobs on our 5-axis mill, what sets us apart from most other shops using the technology, is our focus on using the process for short run and prototype machining. 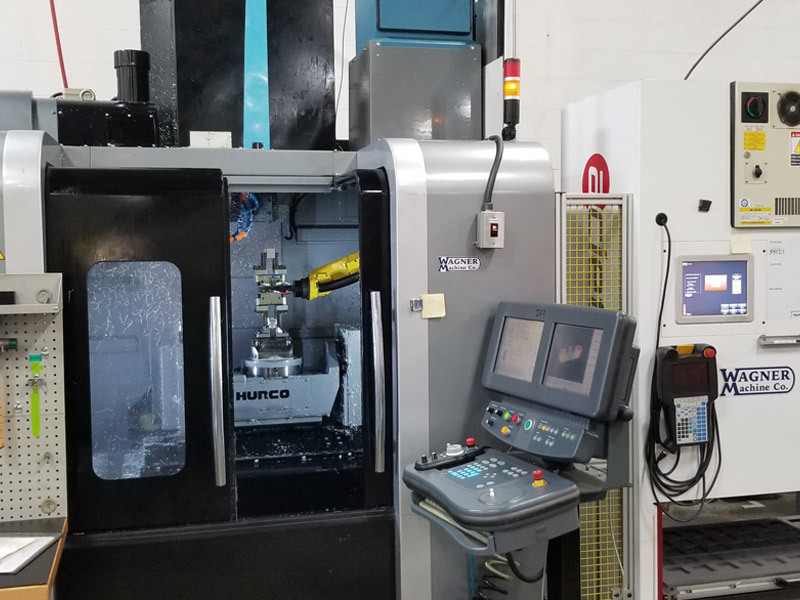 We use 5-axis machining to run a wide variety of parts, ranging from relatively simple parts with operations on multiple sides, to parts that require full simultaneous 5-axis contours with extremely tight tolerances. By allowing machining on all sides of the part (except for the fixturing side) in one operation, 5-axis milling offers many advantages over standard 3-axis milling. Among them, are reduced setup time, simplified fixturing, optimized machining operations, and higher accuracy parts with better repeatability. All of these benefits work together to help us machine superior parts at a lower price, while maintaining the shortest lead times possible. To help program and machine your parts, we use advanced 5-axis CAM software from Delcam. It offers a flexibility that is unmatched by any other program, allowing us to fully utilize the 5-axis machining process. In addition to the use of advanced CAM software, we also program on the shop floor. That ability adds another level of efficiency to our process because it allows us to make changes on the fly at the machine. We document every job, by saving the programs, setup sheets, and digital pictures of our setup. Included in that information are any deburring and finishing notes. We also keep a tooling pack, that contains any special tools that are required for the job. We have integrated all of this into our shop management software, so all of the information is linked to the job in our MRP system, and backed up on our network, as well as off site. All of this documentation allows us to quickly set up your job in the future, and helps us to guarantee consistent part quality from one run to the next.